The Syrian jihadist group Jabhat Fateh al-Sham (JFS), which was known as al-Nusra Front until it broke off formal ties with al-Qaeda last July, has rebranded itself again. A statement issued on 28 January announced that it had agreed to merge with four smaller factions and form a new alliance, Hayat Tahrir al-Sham (Liberation of the Levant Organisation). 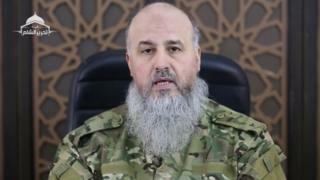 Hashim al-Sheikh, also known as Abu Jabir, who had previously been the head of the now-rival Islamist rebel group Ahrar al-Sham, was named its new leader. There was no mention in the statement of the long-standing al-Nusra and JFS leader, Abu Mohammed al-Jawlani. However, Tahrir al-Sham confirmed weeks later that he had been appointed the alliance's "general military commander". On 9 February, Abu Jabir delivered a message in which he insisted Tahrir al-Sham was an "independent entity and not an extension of former organisations and factions". It appeared to be an attempt to further distance the group from al-Qaeda. But it is not clear how effective that will be, as the last name change failed to convince the international community and the US kept the group on its list of foreign terrorist organisations. The statement announcing the creation of Tahrir al-Sham said JFS had joined forces with the Nour al-Din Zinki Movement, one of the most important opposition factions in Aleppo province; Ansar al-Din Front; the Homs-based Jaysh al-Sunnah; and Liwa al-Haqq, which operates in Idlib, Aleppo and Hama provinces. The groups would dissolve themselves and "merge fully" into the new entity, the statement added. That was further reiterated by Abu Jabir's recent message, which described the new body as a "melting pot for all factions". In addition, no new propaganda has been issued using the JFS brand since then. The new alliance also received the endorsement of six prominent Syria-based jihadist clerics. The clerics, who included the charismatic Saudi-born Abdullah al-Muhaisini, signed a separate statement announcing their intention to join. Abu Jabir was appointed Tahrir al-Sham's leader despite coming from a group that chose not to part of the new alliance. He became head of Ahrar al-Sham in September 2014, after its entire leadership was wiped out in a bomb blast. He held that position until September 2015. According to several accounts, Abu Jabir was born in 1968 in the northern city of Aleppo. He is said to have fought alongside al-Qaeda in Iraq under Abu Musab al-Zarqawi, and helped Syrian jihadists travel to the country. Reports indicate he was arrested later in Syria and that he was one of many Islamists released from prison in 2011 under an amnesty ordered by President Bashar al-Assad. Abu Jabir's appointment as leader of Tahrir al-Sham marked the culmination of months of tension between moderate and hardline elements within the group, which escalated amid disagreements over the prospect of a merger with JFS. As attempts at the merger failed, hardliners within Ahrar al-Sham - including some prominent figures led by Abu Jabir - defected to Tahrir al-Sham. That placed the new entity in the position of a rival to Ahrar al-Sham, which has in turn taken a number of smaller factions under its wing. Abu Jabir reached out to other factions in his message on 9 February. He urged them to "forget the past" and join Tahrir al-Sham as it sought to continue the fight and realise a goal of the uprising, the overthrow of President Bashar al-Assad. In an apparent reference to January's talks in Astana between several rebel factions and the government, Abu Jabir warned that the war would not be ended "by a negotiation session or conferences which suppress the revolution and crown the butcher". Abu Jabir's dismissal of efforts to find a political solution might, however, end up alienating the factions that have showed a willingness to engage. That would in turn make it harder for Tahrir al-Sham to embed itself more deeply within the wider insurgency and disassociate itself from the al-Qaeda brand, at least for the time being.